Gula Melaka or palm sugar are widely and popularly used in Nonya, Malaysian, Thai and South East Asian cooking (including drinks and desserts) …Just to name a few : Ondeh-Ondeh, Kueh Dadar, Sago Gula Melaka, Kueh Bingka with Gula Melaka, Chendol, Pandan Kaya etc. etc. 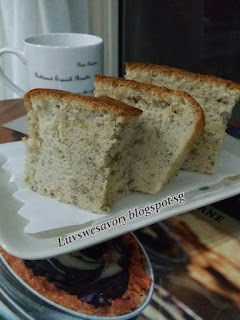 Have some over-ripe bananas and since I’ve not added palm sugar syrup in cake baking, tried out this recipe with lots of good review. Thanks to Jeannie Tay for sharing this recipe. 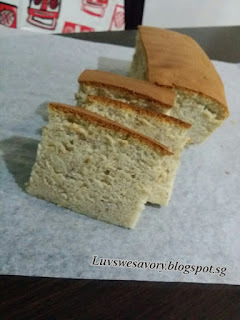 Indeed, the texture is fluffy soft, fragrance of banana and palm sugar aroma that I could not stop with just a few slices at one go. Shared some with my colleagues and they too gave thumbs up ! Recipe adapted from : Jeannie Tay. Below my slight adjustment made on eggs and sugar. 1) To make the Gula Melaka syrup, place chopped Gula Melaka with 50ml of water in a small saucepan, cook on medium heat for about 8 - 10 minutes till palm sugar dissolves. Stirring occasionally to make sure nothing sticks to the bottom of the pan. Reduce heat to low and simmer for about 3 - 5 minutes until the syrup is slightly thickened in texture. Obtain about 70g and set aside. 2) Preheat oven to 160°C and position the rack in the center of the oven. 3) Line bottom of an 8 inch (20 cm) square pan with parchment paper, grease it as well as the sides of the pan with some butter. 4) Sieve together the flour and baking soda. Set aside. 6) In a clean mixing bowl, whisk the cold egg whites and cream of tartar till foamy using a handheld electric mixer. Gradually add in caster sugar in 3 separate additions and beat till stiff peak, formed into a firm meringue. 7) In a big bowl, place the mashed banana, oil, egg yolks, salt, gula melaka syrup and whisk the ingredients until combined with hand whisk. Pour the flour into the mixture and mix until well combined. Do not over mix. 8) Using a hand whisk, gently fold in the meringue to the yolk mixture in 3 additions until it looks evenly mixed. Pour into the prepared cake pan at a height. Gently tap the pan a few times on table top to get rid of big bubbles. 9) Make a water bath by pouring 3 - 4 cups of hot water into a tray/dish. Place the cake pan in a water bath and bake for 70 minutes at 160°C. If the top of the cake becomes too brown, tent it with sheet of aluminium foil and continue baking. *Note : I tent it in the last 20 minutes of baking. The temperature of the oven may vary, do adjust the temperature and timing to suit your oven. 10) Remove the cake pan from oven, let it cool for about 5 minutes or until cake has pulled away from the sides before inverting on to a smooth flat plate. Remove paper lining and re-invert on to a rack to cool. Hi Karen, your gula melaka sponge cake look very moist. Anything with gula melaka sure taste and smell good. Thanks for sharing, regards. Ooo...this is a nice one. I can imagine the flavour!